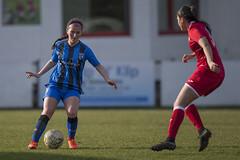 During the 2015/16 season Gillingham Ladies joined forces with the Kent Ladies and Girls Football League to offer all affiliated clubs within KL&G Football League a unique opportunity to be match day mascots at Gillingham Ladies home games. Sarah M’Grady from Larkfield Ladies said “Girls ranging from U7 to U11 were lucky enough to be match day mascots in the 2015/16 Season. All the girls were made to feel very special from going in the changing room, to getting autographs and photos after the match. 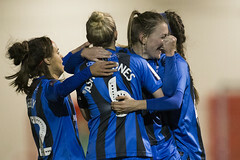 Gills Ladies are fantastic role models for our girls and a lot of them look up to the Ladies as people they aspire to, so for them to be treated so kindly is an amazing thing for the Ladies to take the time to do. It is a pleasure to be associated with such a great club. 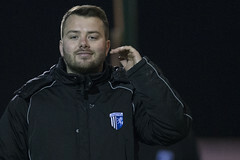 Gavin Hawks from Woodcombe Girls said “We were lucky to have 9 girls from our U13s team be match day mascots during the 2015/16 Season. 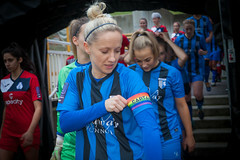 The girls waited at the end of the tunnel as the Ladies came out of the dressing room and the girls were full of smiles as they were lead onto the pitch followed by the Respect handshakes. The girls were excited to meet the players after the match and were given a squad poster to use for authographs. It was a really enjoyable day and a great experience for any budding young player. A personalised official certificate for every mascot. For more information and availability during the 2017/18 season please contact Jack Wheeler (jackwheeler@priestfield.com) who co-ordinates the arrangements. 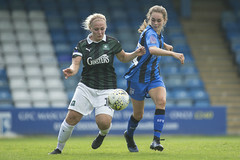 Hi, who would I need to contact in regards to the Gills Ladies teams?